The Silk Road was a trade route that went from China to Eastern Europe. It went along the northern borders of China, India, and Persia and ended up in Eastern Europe near today's Turkey and the Mediterranean Sea. The Silk Road was important because it helped to generate trade and commerce between a number of different kingdoms and empires. This helped for ideas, culture, inventions, and unique products to spread across much of the settled world. It was called the Silk Road because one of the major products traded was silk cloth from China. People throughout Asia and Europe prized Chinese silk for its softness and luxury. The Chinese sold silk for thousands of years and even the Romans called China the "land of silk". What goods did the Chinese trade? Besides silk, the Chinese also exported (sold) teas, salt, sugar, porcelain, and spices. Most of what was traded was expensive luxury goods. This was because it was a long trip and merchants didn't have a lot of room for goods. They imported, or bought, goods like cotton, ivory, wool, gold, and silver. Merchants and tradesmen traveled in large caravans. They would have many guards with them. Traveling in a big group like a caravan helped in defending from bandits. Camels were popular animals for transport because much of the road was through dry and harsh land. Although there was some trade between China and the rest of the world for some time, the silk trade was significantly expanded and promoted by the Han Dynasty which ruled from 206 BC to 220 AD. Later, under the rule of the Yuan Dynasty set up by Kublai Khan of the Mongols, trade from China along the Silk Road would reach its peak. During this time the Mongols controlled a significant portion of the trade route, enabling Chinese merchants to travel safely. Also, merchants were granted more social status during the Mongol rule. It was over 4,000 miles long. 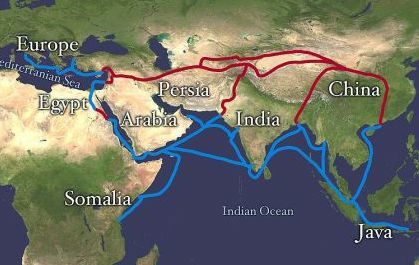 Marco Polo traveled to China along the Silk Road. Not all that was traded along the Silk Road was good. It is thought that the bubonic plague, or Black Death, traveled to Europe from the Silk Road. There wasn't just one route, but many routes. Some were shorter, but more dangerous. Others took longer, but were safer.